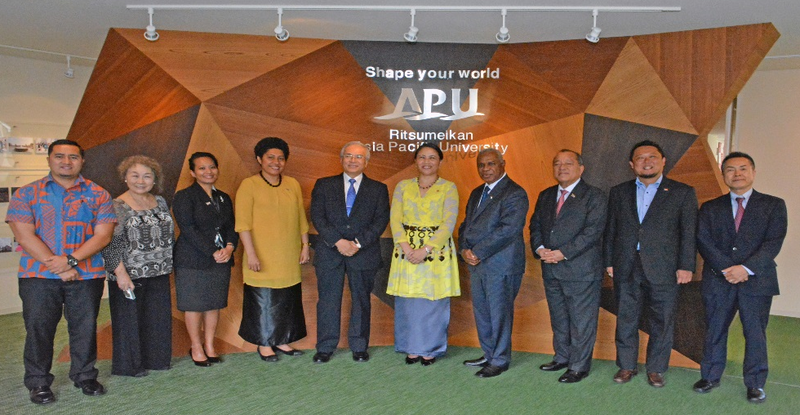 Envoys of the Pacific Island Countries (PICs) on Friday, 10th June, travelled to Beppu City and Oita City in the Kyushu region (South of Japan) for a two day conference organised by the Asia Pacific University (APU) Oceania Students Association as part of the week long Oceania programme. The FET was represented by Counsellor Korovou in her capacity as the Charge’ d’ Affaires. The two-day Conference featured discussions and exchange of views by PIC’s Embassy representatives on the theme of Climate Change, and was also aimed at promoting the the Pacific to the APU and Oita community at large. This was an enriching experience for the audience, majority of whom were APU students and academia. The space allowed the PIC envoys to share information and encounters on Climate Change impacts in the region based on experiences of individual island state. The discussions also spanned issues on women in diplomacy, life of a diplomat, labour migration, and ODA in the context of climate change. The FET undertook Prefectural visit to the south of Japan in April (26th to 28th), one of the means of forging close bilateral relations with Japanese counterparts and constituents, especially Regional-Japan. Ambassadors Mataitoga, accompanied by FS Nadalo, visited the prefectures of Saga and Fukuoka in the Kyushu region, paying courtesy visits on the Governors of the two prefectures as well as the Mayors of Saga City and Munakata City. The FET team also took the opportunity to visit the Queen Victoria School (QVS) U18 rugby team that was representing Fiji at the annual SANIX World Youth Rugby Tournament (April 26th to May 5th) in Fukuoka. The newly appointed Director of the Pacific Islands Centre, Mr Ryuzo SAITO called on Ambassador Isikeli Mataitoga on 21 April 2016. This was a courtesy visit by the new Director following his appointment and he took the opportunity to discuss a few issues. Mr Saito noted that his background was from the private sector of Japan and he had many years in project business developments for many Japanese Companies in overseas countries. He is looking forward to the challenge of working with the Pacific Island Countries through their diplomatic missions in Japan. 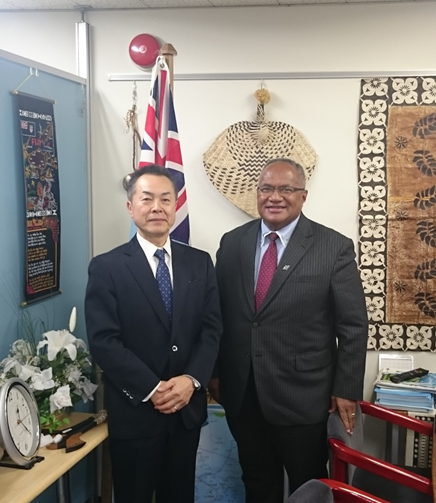 Mr Saito was keen on getting insights and learning from Ambassador Mataitoga’s experience in undertaking business promotion in Japan for Fiji. Ambassador Mataitoga welcome Mr Saito to his new appointment and advised him that the Fiji Embassy, Japan will assist him and the PIC during his tenure, as it has done in the past. He encouraged Mr Saito to learn the challenges of small island states and take time to understand the situations of each PIC. The Fiji Embassy, Tokyo is happy to assist him and our network of Honorary Consular Corp in Japan, as he develops his priority activities for the Pacific Island Countries. 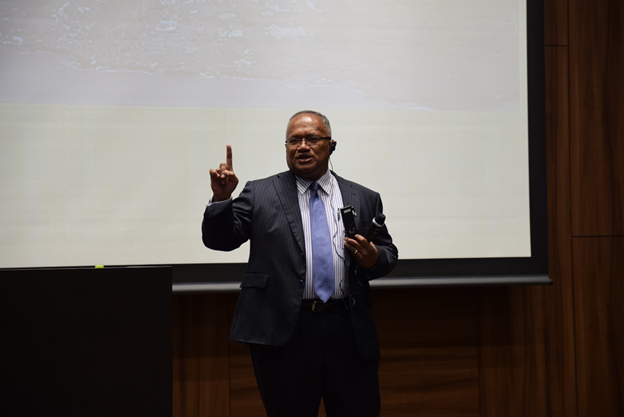 The Sasakawa Peace Foundation [SPF] together with the Embassy of the Republic of Fiji in Japan held an Advocacy Seminar in Tokyo on Tuesday, 12 April 2016, to provide information of the damage assessments post TC Winston and identify the priority areas of the Fiji Government for assistance. 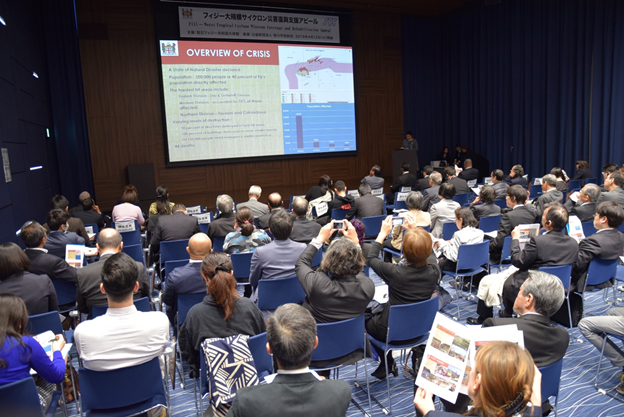 Senior Government politicians, government officials, members of the local diplomatic corp, representatives of business sector, representatives of Non-Government Organizations, academia, interested individuals and friends of Fiji in Japan attended the seminar. Over 70 people attended the seminar. The seminar started with the opening remarks from Ambassador Isikeli Mataitoga providing an overview of the damaged sustained and potential areas of assistance that Japan may support. 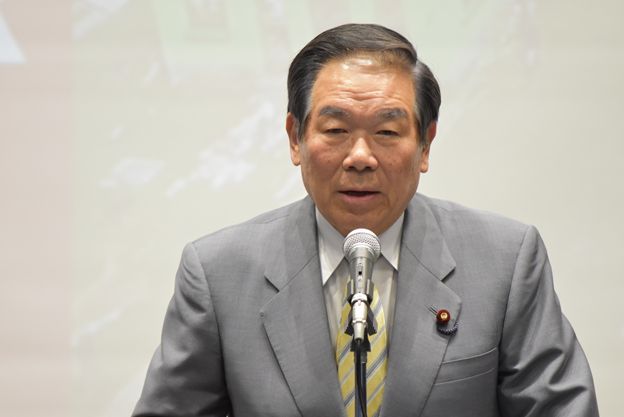 This was followed by remarks from the Honorable Mr. Fukushiro Nukaga MP, Chairman of the Japan/Fiji Parliamentary Friendship League on the role they will play in supporting Fiji’s effort rebuild a better Fiji in the aftermath of TC Winston. The seminar then heard a detail presentation from Mrs Julia Korovou [Counsellor] on the government’s efforts during the relief and now into the beginning of the rebuilding stage post TC Winston. The detail damage cost estimates by sectors were provided to participants. The two recent government initiatives on “Help for Home” and “Adopt A School” were also explained to the participants and they were challenged to support the efforts of the Fijian Government in rebuilding a better and more resilient Fiji, having learnt the lessons from TC Winston. The seminar provided an opportunity for Ambassador Mataitoga to express the Fiji Government’s deep appreciation to all those governments, organization and individuals for their generous assistance thus far. He also noted that Fiji is looking to the Japanese Government for special expertise and funding support during the rebuilding phase based on the Sendai Framework for Disaster Risk Reduction. The seminar is the second stage of the Fiji Embassy efforts to raise funds for relief and rehabilitation work in Fiji. The first phase involved the opening of a bank account with a local Japanese Bank in early March coinciding with the Ambassador writing to targeted recipients including Mayor of municipalities, Governors of several Prefectural Governments that have close collaboration with Fiji, business leaders and individuals, requesting financial donation towards the Fund Appeal for TC Winston Relief and Rehabilitation. 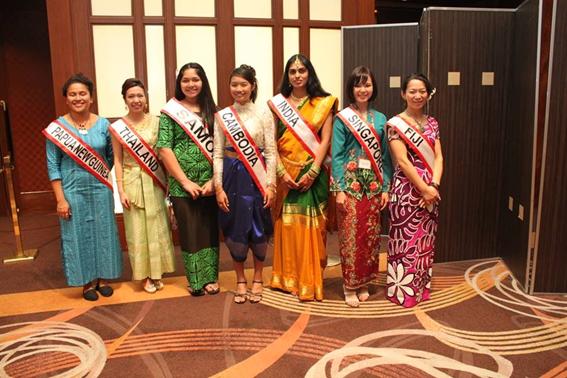 The Asia-Pacific Ladies Friendship Society (ALFS) comprising of spouses of Ambassadors from Asia-Pacific countries based in Tokyo and the Japanese ladies hosted its annual “Charity Bazaar” at the ANA Inter-Continental Hotel, Tokyo on Wednesday, 6 April 2016. The event was officiated by HIH Princess Hanako Hitachi. With 23 member countries from the Asia Pacific region and a general membership of over 300, the bazaar provided a good opportunity for the public to witness the fruit and efforts of diplomatic and Japanese members of ALFS working together. Proceeds from the charity event are shared amongst participating countries for charitable assistance in their home countries. 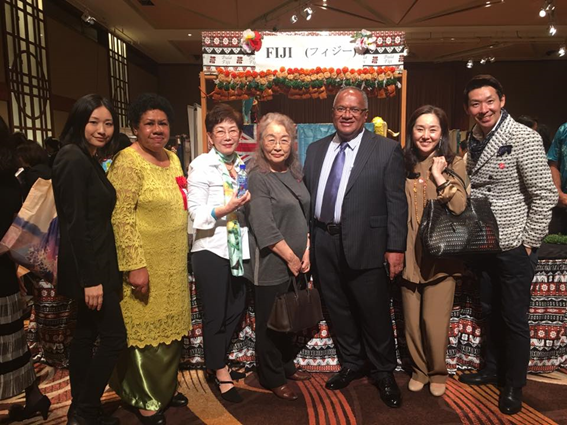 HE Mr Isikeli Mataitoga and Madame Venina Mataitoga greeted HIH Princess Hanako Hitachi at the Fiji Handicraft booth and introduced Her Imperial Highness to the various products offered by our booth. Fiji’s participation included a Fiji Food booth and a separate booth for Handicraft goods. Fiji brand commodities like AQUA Pacific water, Punjas Curry spices, Fiji Raw Cane Sugar, Pure Fiji and Virgin Coconut Oil products generated quite a lot of interest. The yearly occasion remains as a tremendous opportunity to market Fiji in terms of tradable commodities and Fiji as a tourist destination. The Embassy is truly grateful for the assistance from Fiji friends who volunteered to assist at the Fiji booths and all to those that purchased the FET – ALFS Charity Bazaar 2016 Door and Raffle tickets. The four-hour event was enjoyed by everyone who attended. In a solemn ceremony held today Thursday 7 April 2016 at the Japanese Parliamentary Complex in Tokyo, Japan, the Honorable Mr. Fukushiro NUKAGA MP, Chairman of the Japan/Fiji Parliamentary Friendship League handed the financial donation from the Members of the Parliamentary League to Ambassador Isikeli Mataitoga. The money which will be initially deposited in the Bank Account opened in Tokyo for the PM’s TC Winston Relief and Rehabilitation Appeal before it will be sent to main account in Fiji, at the end of the appeal period which is 31 May 2016. Ambassador Mataitoga in accepting the generous donation from Honorable Nukaga, expressed the deep appreciation and gratitude of the government and people of Fiji to the Japanese Government and people for their support towards Fiji in the aftermath of the devastation caused by TC Winston in Fiji on 20-21 February 2016. He also underscore the need for further Japanese assistance, in the rebuilding stage post TC Winston, in ensuring a more resilient and safe community is developed. Fiji will bounce back from this experience, more mature, resilient and a safer country as we learn the lessons of TC Winston. There were three Ministers and 7 other Member of the Japanese Parliament attended the ceremony to personally express their condolences for the loss of life caused by TC Winston and to show their solidarity and empathy towards Fiji and its people at this difficult period in our history. 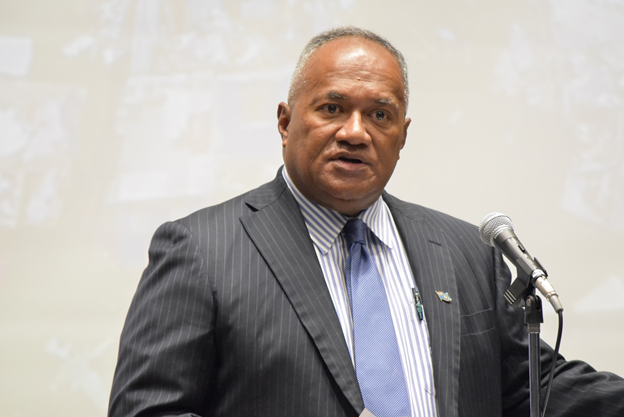 Fiji’s Minister for Agriculture, Rural & Maritime Development and National Disaster Management – Hon. Mr Inia Seruiratu, held bilateral talks with his counterpart, Hon. Kono Taro MP, Minister of State for Disaster Management, at Disaster Management Bureau Building on Friday 29th January. The meeting was an opportunity for the Hon. 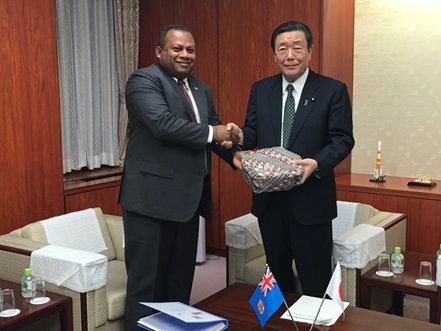 Seruiratu to update the Japanese government on the disaster management initiatives being pursued by the Fiji government, as well as put forward request for assistance to build capacity in the area of disaster management. The Hon. Minister Seruiratu was accompanied to the meeting by Fiji’s Ambassador to Japan, H.E Mataitoga and Fiji Embassy staff, First Secretary Mr.Nadalo and and Second Secretary Ms.Savu. Fiji is looking at Japan as a potential partner to help realise our true potential in the agriculture sector, in particular with agro-processing. 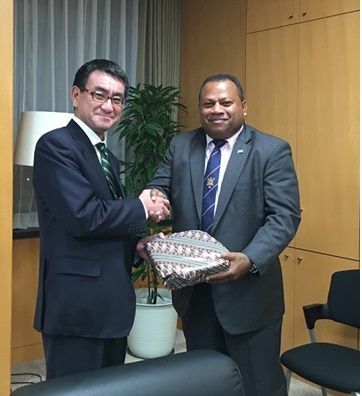 Agriculture Minister, Inia Seruiratu, met with the Japanese Minister for Agriculture, Forestry & Fisheries, Hiroshi Moriyama, on Tuesday 26th January, in Tokyo. The meeting was to discuss and promote trade and investment cooperation between Fiji and Japan. “Fiji has huge potential in its agriculture sector in view of agro-processing,” Mr Seruiratu said. “But for these to materialise will require the assistance of development partners, and Japan is a partner that Fiji looks to for relevant support in this regard. 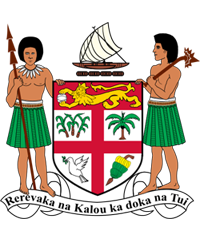 “In particular, Fiji needs an agro-processing laboratory, food technologists and value-adding technology, and know-how to strengthen its value-adding capacity. “This is to realise the full potentials of its abundant tropical fruits and vegetables in terms of exports. In response, Mr Moriyama said considering similar characteristics of Fiji and Japan’s climate and agro produce, the provision of expertise assistance would prove ideal. The Hon.Seruiratu was accompanied to the meeting by Fiji’s Ambassador to Japan, H.E Mataitoga and Fiji Embassy staff, Counselor Mrs Korovou and Second Secretary Ms.Savu. In yet another milestone development, the Fiji Embassy Tokyo, on the eve of 19th of January 2016, successfully commissioned Mrs Mami Kawamura as Fiji’s Honorary Consul in Beppu City, Oita Prefecture in the Kyushu region, Japan. 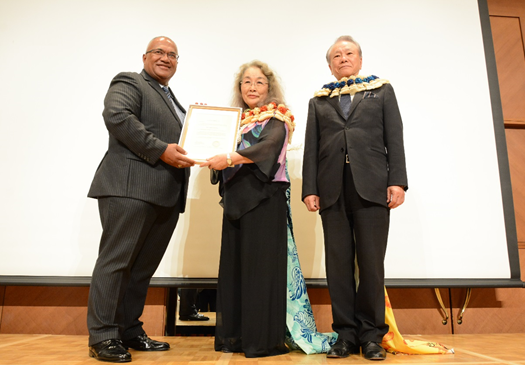 The inauguration event was marked by the official handing over of the Consular Commission that was signed by Fiji’s Minister for Foreign Affairs, Ratu Inoke Kubuabola, by His Excellency Isikeli Mataitoga, Ambassador Extraordinary and Plenipotentiary to Mrs Mami Kawamura. Ambassador Mataitoga congratulated Mrs Kawamura on behalf of the Government of Fiji for accepting the appointment, and expressed profound gratitude for her for her integrity and industry. The opening of the Honorary Consul underscore Fiji’s long standing policy in establishing and maintaining friendly relations with countries that have demonstrated genuine goodwill towards Fiji, using it to widen and deepen Fiji’s diplomatic footprint in an important region of Japan. It is also a reflection of the goodwill enjoyed between Japan and Fiji since 1970 in the promotion of economic, commercial and people-to-people relations between the two countries. Ambassador Mataitoga stressed on the growth in the number of Fijian students studying in Ritsumeikai Asia Pacific University (APU), to which we now have 14 Fijian students in Beppu alone compared to 1 student four years ago. This is apart from the 16 Fijian students that are currently pursuing studies in graduate schools and specialized programs throughout Japan, under the Japanese Government (Monbukagakusho) Scholarship program. indeed, a major development in Fiji/Japan relations. 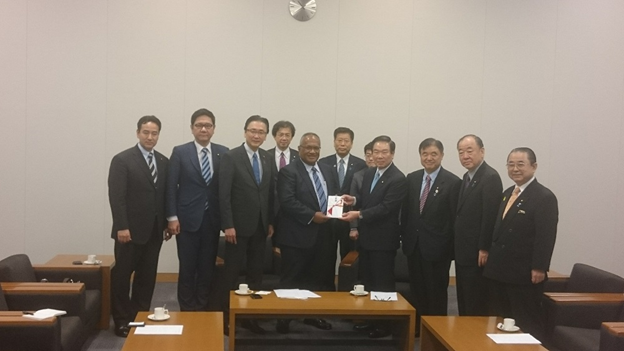 With the establishment of the new Honorary Consul`s Office in Beppu, Ambassador Mataitoga is confident that Fiji stands to gain much more from deepening its tourism, trade, and investment promotion in not only Oita but throughout the Kyushu region. The presence of the new Consulate office is anticipated to also promote greater public diplomacy in the form of tourism, school and people to people exchanges and further boost economic and trade cooperation between Fiji and the people of Oita. The Fiji Consulate office in Oita is expected to serve as an excellent outpost to launch and promote Fiji in the Southern part of Japan. 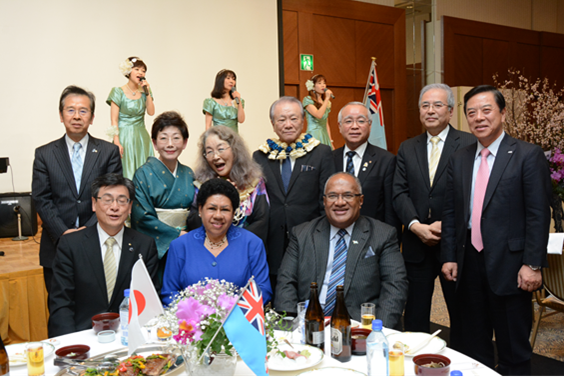 Fiji now has two Honorary Consuls and an Honorary Consul General in Japan, located in three different Prefectures. Ambassador Mataitoga in keeping with his vision intends to set up similar arrangements in other regions of Japan. Before the Commissioning Ceremony for the Honorary Consul, Ambassador Mataitoga and diplomatic staff from the Embassy held a Trade & Investment Seminar, in which 51 members of the Oita Chamber of Commerce & Industry was represented. This another major step in promotion Fijian made products in an important and growing region of Japan. The incumbent will be responsible to the Ambassador in the management and operation of all physical, manpower and financial resources allocated to the Account Section for the implementation, monitoring, coordination and evaluation of the Embassy`s account. Another function involves conducting the annual Board of Survey, Staff Leave Administration and assisting in interpretation – Japanese to English and vice versa or any other additional duties required by the Ambassador. Qualification: A relevant Degree in Accounts and Finance Management or equivalent from a recognised institution. The incumbent should have at least 5 years’ service in any organization in Japan. Special Requirements and additional qualification in Interpretation and Human Resource Management would be an added advantage. Skills: Excellent analytical skills with advanced Excel Spreadsheet including ability to prepare cash flows, Variance analysis, Financial ratios & others and have knowledge of various Accounting Softwares and systems. Applications for the said post must be addressed to the Ambassador (Attention: Second Secretary, NOA Bld. 14F, 2-3-5 Azabudai, Minato-ku, Tokyo 106-0041). All applicants must include their Curriculum Vitae (CV) and Original transcripts (with English translation if needed). Closing date for all applications must arrive by Monday, 10 August 2015. Late applications will not be considered.